USF had just started the Broadband project where the criterion for getting subsidy was to prove to the Technical Auditors that the target number of broadband connections were actually working. The idea behind this criterion was that subsidies should not be given just for laying broadband infrastructure. Rather the broadband service providers should be made to ‘sell’ broadband connections – by creating necessary (but lacking) awareness among the people AND by making broadband affordable. As the bidding allowed multiple winners (mainly to promote competition), one of the winning bidders was PTCL. Someone in PTCL, in his zeal to get the subsidy quickly, decided to acquire the necessary number of broadband connections just by lowering the tariff from Rs 1,199 to an incredible Rs 299 per month! But such a drastic reduction had to have a catch in it and the catch was that if the customer exceeded the download limit of 1 GB, he/she had to pay @ Rs 200 per GB extra. And somehow the reverse of this message got communicated! Guess what happened when customers received their huge bills at the end of first month? Most of them ran away even before the Tech Auditors could start counting them. But hats off to PTCL because as soon as they realised what had happened they started damage control. They modified the low tariff, introduced a max limit, made it clear to everyone what the low tariff consisted of and compensated the effectees (it’s a different story that they had to form queues for that!). They also rationalised their overall tariffs. It took months to bring back the annoyed customers. 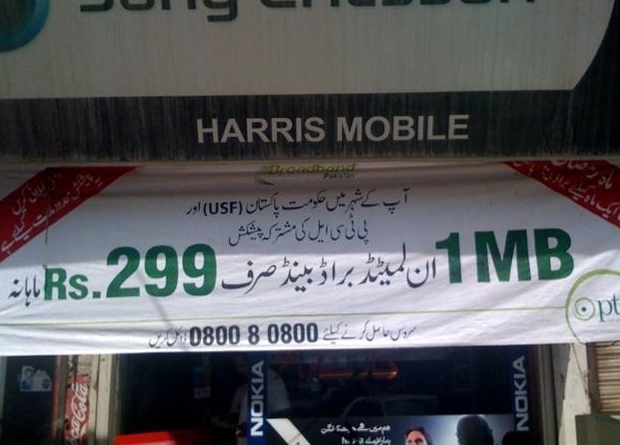 But whoever in PTCL thought of lowering tariff to attract broadband customers wasn’t actually wrong. Affordability is a big issue in Pakistan and continues to be one of the main impediments in growth of broadband. For a country where majority of the people scrape through their daily lives and 24% people live under the poverty-line, it is pretty obvious. Although USF subsidies and overall market conditions have helped to lower broadband tariffs but most of the price-reductions got eaten up by inflation/devaluation and the rest has gone to increase broadband speeds. Consequently now for the same amount of Rupees one can get 4 times the speed of 2008. Calculations given below show that on average a Pakistani household spends little more than 1% of it’s average spending on telephony. And if Broadband is added to an average household’s monthly spend (at the present rates that vary from Rs 300 to 1,200 per month), the percentage spent on ICT (Voice + Broadband) becomes 1.7% to 3.5% – not a big deal if you look at comparable countries. That raises an interesting question: If 40% of Pakistani households are in cities and out of those only 30% can be considered to be “average-or-above” then 3.1 Million households fall into a category who can afford broadband. So there should be at least that many Broadband connections in the country! However there are about half of those! “Why” is a separate discussion, that involves multiple issues – availability (of broadband and PCs), awareness, content and necessity – yes, necessity! (Indeed it is acknowledged that these represent average figures meant only to provide some indicators. Also in no case it is meant that tariffs should not be lowered further, to bring benefits of broadband to maximum number of citizens).